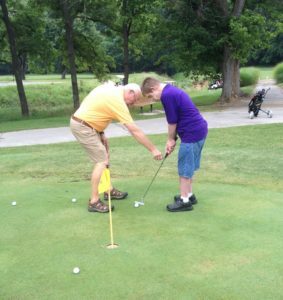 The St. Louis Arc offers a multitude of activities throughout the year that keep our participants engaged and entertained. We believe that sports are more than just a game, but rather a platform for community equality. Whether you are ready to join a team or come out and cheer us on, your support goes beyond a winning goal. For a complete schedule, times, and locations, view our 2019 Spring Summer Leisure Times and Registration Form. For financial assistance, please click here. 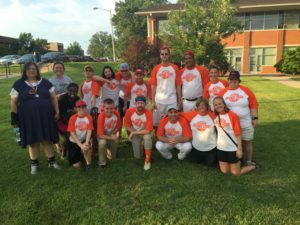 Get your ball and glove ready and join the fun as you play in the St. Louis Arc Softball League! We have several teams in various areas around St. Louis. No experience is necessary. For more information, contact Dan Correll, Coordinator of Leisure Services, at 314-817-2227. Perfect your swing, practice your putting, or test your driving distance from the tee! All skill levels welcome. A professional instructor will assist you to learn proper techniques and enjoy the game of golf. For more information, contact Dan Correll, Coordinator of Leisure Services, at 314-817-2227. Grab your bowling ball and shoes and let’s hit the lanes for some bowling. You can choose to bowl at four different leagues and bowling alleys across the St. Louis area. For more information, contact Meghan Murphy, Coordinator of Leisure Services at 314-817-2250. Come and be a part of what’s said to be the most popular sport in the world: SOCCER! Grab your ball, cleats and head to the field to learn the basics or perfect your athletic skills. Join the excitement! For more information, contact Dan Correll, Coordinator of Leisure Services, at 314-817-2227. Join the excitement of the St. Louis Arc basketball league. The basketball teams play at various locations throughout St. Louis City and County. For more information, contact Dan Correll, Coordinator of Leisure Services, at 314-817-2227. Do you like to dance or socialize with friends? Join the fun at two different locations: Club South in South City where you can enjoy the sounds of a live band, or Club 1177 in Creve Coeur where a DJ spins the hits. Dance club participants must be 18 years of age or older, and present a Dance Club Card for admission. For more information, contact Clinton Hall at 314-817-2293. Walking is great way to exercise, stay healthy, socialize and support your community. We will accommodate the novice as well as the fast paced walker. Walking Club is for adults ages 18 and older who would like to get moving with the St. Louis Arc. Family members and friends are also encouraged to register. For more information, contact Dan Correll, Coordinator of Leisure Services, at 314-817-2227. 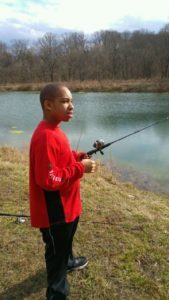 St. Louis Arc’s R&R Camp is a weekend camping program that serves St. Louis County residents who have intellectual and developmental disabilities with high support needs. This program takes place at the Wyman Center in Eureka, MO. R&R Camp is for people ages seven and older and focuses on each person as an individual with unique abilities, opinions, and qualities. Campers are encouraged to discover their strengths and preferences through participation in a variety of recreational and outdoor camp activities. Participants attend three to four weekend sessions between September and April. Staff ratio at camp is 1:1. To sign-up, or receive additional information, contact Chelsea Snorton, Coordinator of Leisure Services at 314-817-2249.